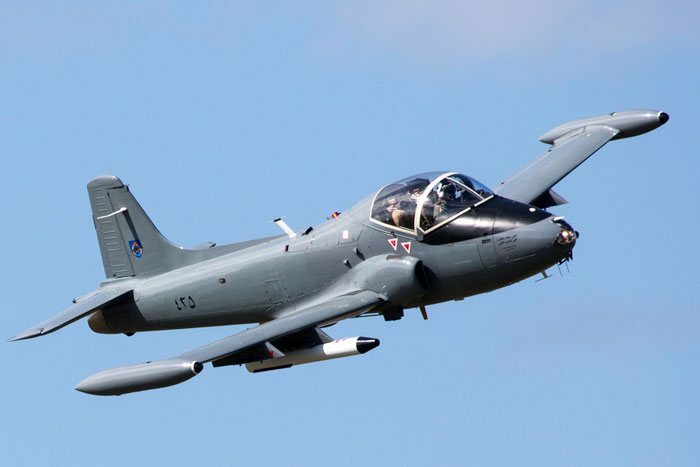 An airshow has been a feature of summer entertainment at Clacton for 27 years: 2019 will be the 28th, so they are well practised at providing an excellent show in the air and around the shore, with trade stands, food court and on-site entertainment. The Red Arrows are also a staple feature but this year they will not display because of their planned tour of the USA and Canada. Radio Airshow is usually provided by BBC Essex on 103.5FM and 729MW. Clacton has an extensive shoreline with a sandy south-facing beach within a gently curving bay. As well as the 360M long pier, several wind turbines provide a backdrop for some of the displays. Clacton's free two-day seaside airshow has been organised by the local authority, Tendring District Council for 26 years, making it one of the UK's longest running airshows. Unusually, it is not held at a weekend, but on the Thursday and Friday before the August Bank Holiday. An estimated 250,000 people flocked to the seaside at Clacton-On-Sea for the 27th Clacton airshow. Although the show itself has been running all those years, night flying is relatively new. The Clacton Airshow introduced it in 2016 when the idea was in its infancy and repeated it to great acclaim in 2017. Nightflying was back for the third year running at the 2018 airshow, featuring Brendan O'Brien in Otto the helicopter, the Twisters and the Fireflies and the Tigers Parachute Display Team. At dusk, before the light was low enough for the pyrotechnics fired by the nightflyers, it was the turn of the Great War Display Team who marked the centenary of the end of World War I with their debut at this show with a rare dusk display. On Friday during their more traditional daytime display, the team dropped between 30-40,000 biodegradable poppies in memory of those who fell in the first war and to mark the centenary of the RAF. The RAF themselves were well represented, including a single flypast by the A400M and a display by the Typhoon on Thursday; the Chinook on Friday and, on both days, the Red Arrows who finished their routine with the 2018 signature finale: a ‘100’ in the sky underlined with coloured smoke, to celebrate the 100th anniversary of the RAF. Foremost amongst the civilian displays was the king of aerobatics, Richard Goodwin, who was astounding, as always, as was the Strikemaster in which Mark Petrie flew his solo routine but also made passes in the company of the Norwegian AFHS Vampire pair. Other displays are listed in the table. An issue with Merlin engines in the BBMF fleet was being investigated at the time of the show. Whilst the investigation was ongoing, appearances by the Lancaster and other Merlin-engined BBMF aircraft were paused. The display by the Lancaster and two Spitfires was therefore cancelled and replaced by the BBMF Mk XlX Spitfire, which has a Griffon engine. The Clacton Airshow is one of the longest-running free airshows and celebrated its 26th year in 2017. 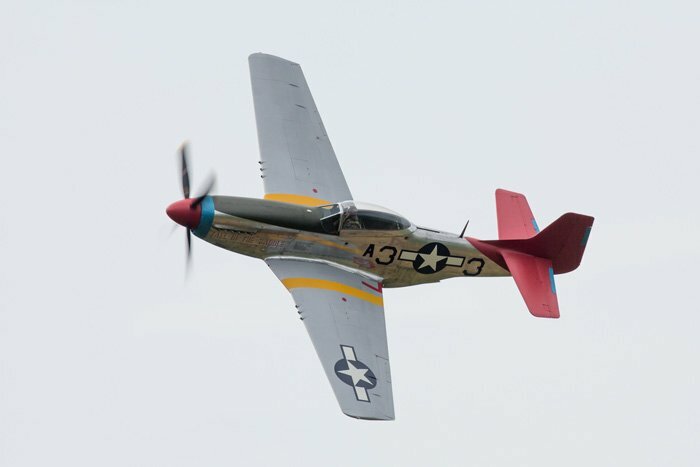 It is not as big as some other seaside shows but there is always a good mix of military and classic aircraft; exhibition and trade stands, food court and on-site entertainment. A short evening programme was introduced in 2016 on the first day of the show to celebrate its 25th anniversary and was repeated in 2017. The night flights, featuring The Fireflies, The Twisters and Otto the helicopter, were followed by fireworks. The RAF supported the show with a display by the Tutor, which has returned to the display circuit after a break last year. The Lancaster was also due to display, escorted by a pair of BBMF Spitfires, but unfortunately all displays by the Lancaster and other BBMF Merlin-engined aircraft had been paused because of an issue with the BBMF's Merlin engines. In place of the intended trio, the BBMF's Mk XlX Spitfire, which has a Griffon engine, made a solo display instead. The first civilian display to be announced was the Duxford-based Catalina, which had not been seen at Clacton for a few years. Although now a civilian aircraft, owned and operated by Plane Sailing, the Catalina's background is in the military, initially in Canada. Dropping in, too, were the Tigers from the Princess of Wales' Royal Regiment. As well as the Red Arrows, there were four more jets: The MiG-15 and Strikemaster were late additions to the programme and the De Havilland Vampire FB.52 and FB.55 from the Norwegian Air Force Historical Squadron returned after appearing at last year’s event. Also returning were Team Raven, the formation aerobatic display team flying Vans RV self-built lightweight aircraft and Gerald Cooper, who has been flying competitively for 17 seasons, and is the holder of numerous British titles. The show is reported to have virtually broken even, earning income and sponsorship totalling about £82,000; attracted 250,000 visitors and brought £5½million into the local economy. The full line-up is listed in the table. The Clacton Airshow celebrated its 25th anniversary in 2016. Although it is not one of the biggest seaside shows, in the absence of airshows at Lowestoft and Southend it was the airshow showcase for Essex. That pariah of seaside shows, the sea mist, was the scourge of the show on Thursday. The Tigers did make their drop to announce the opening of the 25th anniversary airshow, but even as they displayed the haze started to gather and the offshore wind turbines began to retreat behind a cloak of mist. 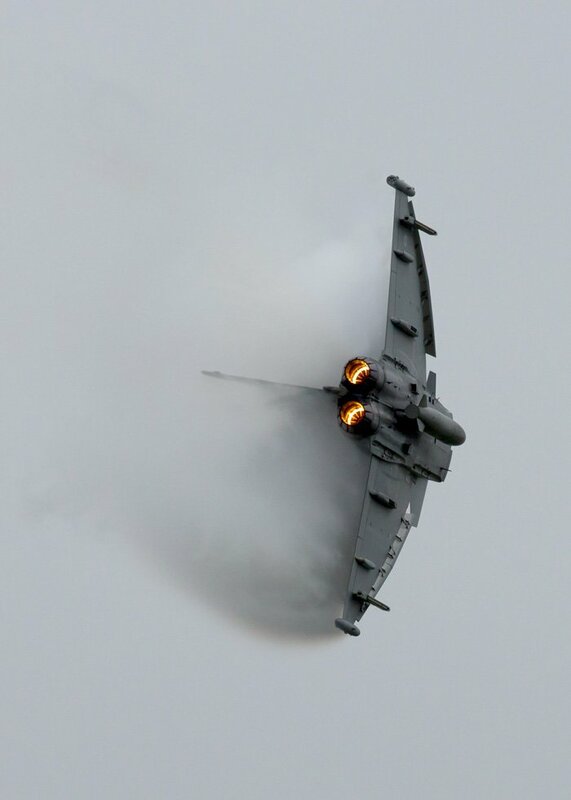 The Typhoon made an entry and it was evident from the roar that a display was going on, but much of it was obscured by the mist, causing Mark eventually to abbreviate his display. The MiG held off for a while before abandoning. The Dutch B-25 did make some passes, but with the cloud still at around 200ft could not display so both it and the holding Sally B were also unable to entertain the expectant crowds. Similarly, the Fireflies, Bronco, Twisters, Xtreme Air and BBMF Spitfires made assessment passes but could not display. The afternoon's display dearth was broken by the Red Arrows, who made a valiant attempt to give the crowd what they had come for and completed the formation half of their display. However, visibility was too poor for the synchro pair who, rightly, called time after their first opposition pass from which point part two of the Reds' display was also abandoned. Deferment of the flying programme for a few hours may have enabled most of the teams to fly, as the mist did eventually clear and the visibility was fine for the welcome and spectacular evening displays. This was the first time in 25 years that Tendring Council had arranged an evening programme, which was held on Thursday only. 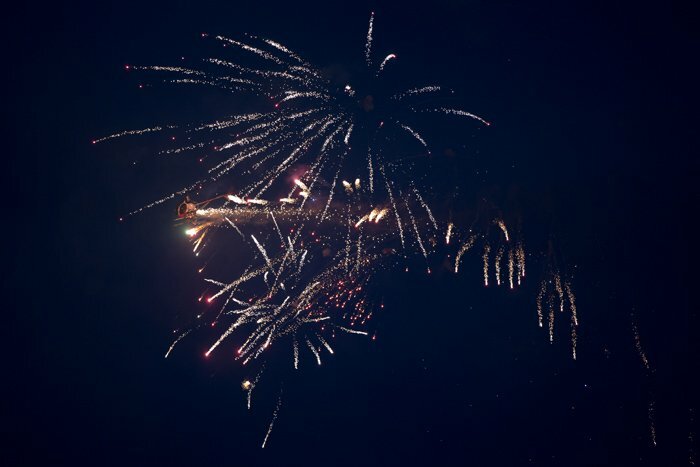 The evening flying included the Twister Duo with pyrotechnics; AeroSPARX in their Grob 109 Motor Gliders, flown by Guy Westgate and Tim Dews with LED lights and wing-tip pyrotechnics and Brendan O’Brien’s 'Otto' Schweizer 300C helicopter, spouting fireworks in all directions. Mercifully, the skies cleared on Friday, enabling a full show; the only interruption being an intruder into the airspace which caused a pause in the Red Arrows' mixture of flat, rolling and full display elements. Aircraft booked to fly. All both days unless stated, although most did not fly on Thursday due to low cloud. The full flying list is in the table and will not be duplicated in text here, but worthy of special note were welcome appearances by Sally B and the MiG-15 jet fighter from the Norwegian Air Force Historic Flight. The MiG-15 was developed for the Soviet Union and was one of the first successful swept-wing jet fighters. It remains in service with the North Korean Air Force as an advanced trainer. Sally B had displayed at the Clacton Airshow in 2015 and made the traditional pass with smoke to honour the fallen. A newspaper misunderstood this and published a story expressing outrage at what it thought was a reference to the tragic incident at Shoreham shortly before. The show organisers were quick to rebook Sally B for the 2016 show. It was good that Sally could complete her display as the definitive response to the inaccurate newspaper report. 2016 has not been a good year for airshow weather. Yet again the good old seaside mist reduced the flying, but what there was will have satisfied those who came for the whole weekend or for the second of the days. Unfortunately, the flying was rather more distant than in earlier years. The new crowd separation distances are measured from the end of the pier as the pier is populated during the displays so this moves them further from the shore, where most of the spectators are congregated. Perhaps it would be better to close the pier and enable the display line to be measured from a point closer to land. Let's hope the evening display, such a success this year, is repeated in 2017. It adds a great deal to the daytime airshow and must encourage many people to stay locally who might otherwise have attended for one day and returned home by dusk. With or without the evening addition, and whether or not the pier is closed to enable a more favourable display line, this is a small show that needs and deserves support: keeping airshows alive in Essex. Use the postcode CO15 1NW until you get close enough to pick up the airshow direction signs. Follow the signs in preference to the sat nav once you see them, as there may be traffic diversions in place. For a detailed route click one of the routeplanner links in the Travel Advice box on the right. National Express have direct coach services from Walton-On-Naze, Frinton, Colchester, Chelmsford, Ipswich, Cambridge, Bedford, Birmingham, Stoke, Coventry, London and Liverpool with connections from further afield. All services stop at the railway station, which is a short walk from the sea. London is about 1¾ hours away by direct train. Local bus services are provided by FirstGroup. You can plan bus, train, ferry and other services in the area at Travelineseatheast. Click the blue Expedia name for a list of hotels and guest houses near the show. The venue is already built into the link, so when the list comes up you just have to adjust the dates, number of guests and rooms, as necessary. For other hotels, the International Hotels Group don't have a Holiday Inn in Clacton itself but they do have one Holiday Inn and one Holiday Inn Express in Colchester, about 17 miles away. Premier Inn do have one hotel right by the seafront and another on the edge of the town.